Well let me tell you what I was mad to my soul when I lissened to my young Merly Jean read what was on this here website. If y’all dont stop makin funna us hill folks I’m a gonna get my Merly Jean to hep me make my own website and tell everbody not to go to that hillbilly crackpot website no more. I’ll tell folks whuts the truth bout us hill folk and we dont cotton ta none o this here hillbilly crackin pot stuff. Except for what parts is about dem northners. I saw one a dem northners one time and I didnt like dem shoes he had on atall! I always heared that they wored shoes but it twarnt nothin like seein it with my own eyes! But honey that was a long time ago. These days most a the reglar kids is all a waring shoes and the men gotta have boots for when they go huntin. Thangs has shore changed from what it was when I was a youngin. Why the other day I seed a growed man that had green hare a standin up all over his head and more make up than my sister Tidly Mae ever wore in her life. Whats a goin on out thar in the world is whut I am a wondrin bout. Anyway all this gets me up to what my second problem was. What in tarnation was I gonna say on a website? I walked round pert near a week a thankin what I was gonna get Merly Jean to write up for that fellers website then I thought of the perfect thang. I comed up with sumthin that wood teach yall whut bein a hillbilly rilly means, but afore I got back to the house I dun fergat what it was. The reason bein was a caws a whut happen when I was a checkin on the hawgs. We gats these two hawgs that ole Pappy Dannels sold us lass sprang. Pappy that old coot dun told us that they was jess baby piglets and we give the old codger four cort jars of my old dead husbands shine fer em. Well child the months went by and dem pigs never did get much bigger. The just got uglier. I’m a tellin ya whuts the truth now! One day sum travlin animal doctor came though here and ma cousin Alvis saw him down thar at sum kind of fare er sumthin. Alvis told him bout are hawgs and so he came over to take a look see at em. 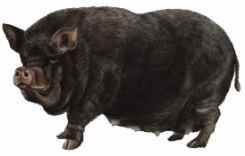 Has anyone heard of a viamanese pot belly pig? Well up to that day neether had we! Ole Pappy Dannels had sold us fake pigs and now we hadda figger out how to eat em. Lord we like to starve ta death waitin fer dem hawgs to get big enuff ta eat so by the time we put em down it twarnt much morn supper. Anyway, I was a spose to be a tellin yall whut happened when I was a checkin on dem hawgs. You dont care nun bout ole Pappy Dannels and are hawg problems round here. Oh, well now I fergat what it was I was a gonna tell you bout. Mebbe this writin thang aint sech a good idee after all. I jess caint thank a nothin to say on a website. Mamaw dont know I’m a writin this part. My name is Merly Jean an I am larnin real hard so I kin be a grate writer sum day. When I grageate frum grade scool I am gonna move outta mamaws house fer good. Also mamaw dont know I put ma name in the title too! Well Merly I think you might have a bright future in writing, but I think it would be a good idea for you to finish grade school then go on to high school and maybe even college. I’m sure it isnt that bad living with your mamaw Gerty, now is it? Just keep learning to spell and practice your writing. Tell your mamaw I said thanks for sending me this. She might be surprised when she finds out it actually got published. When Mamaw talked about getting her own website so she could tell people not to come to this one anymore it was hilarious. Loved it was a funny read and really did remind me of one of my own grandmothers. Howdy yall I cud hardly even bleeve it when I found out ma story was put on here! Mamaw Gerty made me read it out to her but I didnt read the part I wrote bout me. Shed say now Merly Jean this here writin is spose ta be bout me not you. Mamaw Gerty haint a easy person whut to live with and sides I gats 2 brothers and 4 sisters and 9 cousins a livin here most a time too. Are house haint got but 4 rooms, but we stay in the barn a lot a caws its nicer and it dont smell like Mamaw Gerty in thar neether. I am awmost 12 yers old now an I got only 4 more yers til I get out a grade scool. I got failed a mite but its OK a caws nobuddy picks on me at scool since I am the biggest even bigger than any a the boys! Mamaw wunts me to get out a scool and get married up with a boy. She says honey child they haint no man a gonna wunt ya when ya gets too old. She is always fraid I mite get too old to git me a husband but I know I gots a few mor yers afore that happins. Don’t you worry now Merly Jean !!! you will be/are a great writer and that’s a fact in them they’re hills hun!!! Well howdy cuzin Perly. Thats funny evrbuddy knows ya gotta be 12 afore you can get a man on Sadies day. An sides I haint ugly neether an I thank yer tryin ta poke fun at me. I haint never heared a you afore so I am a gonna ask my mamaw who you are. Howdy to Jackie to! I no my writtin haint perfec yet but I am a studyin and larnin how to do it more better. Merly Jean…..I’m shocked beyond belief….no really shocked…what the hey-ell! !…So ya have a school near you hun…that helps ya out a bit then??? You sound rather “briar” to me..